This past weekend, I took a weekend trip with my best friend Bren to a hiker-friendly state park in western Georgia. There, I had the perfect opportunity to test out the new women-specific Gregory Dipsea trail pack. This past weekend, I took a weekend trip with my best friend, Bren, to a hiker-friendly state park in western Georgia. There, I had the perfect opportunity to test out the new women-specific Gregory Dipsea trail pack. We hiked for about three hours on our first morning, and this cute pack (I love the turquoise color!) was the perfect size. It's small and light, with just enough space inside for my hat, some sunscreen, a couple of trail bars, and a hydration bladder full of water. The outer pocket served well as a quick place to stuff my jacket once the rain let up, and the two roomy waist-belt pockets proved quite handy: I put my sunglasses in one (there’s even an elastic strap to keep them from sliding around) and my cell phone and some tissues (hello, allergy season) in the other. 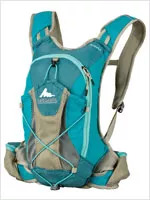 Gregory touts the "bio-sync suspension" of this pack—in other words, there's elastic at the points where the shoulder straps and waist belt attach to the main part of the pack. The idea is that these will act like tendons so the pack will move with you. It works really well—the Dipsea stayed put with no bounce, even when I broke into a jog. Thanks to that and the comfy-cool mesh fabric against my back, I honestly kept forgetting I was wearing it. The Dipsea is also built to hold a hydration bladder, and comes with a "tube management system" that's supposed to allow the drinking tube to snap back into place on the shoulder harness once you're done sipping. The problem is, there are no instructions on how to make this work, nor is there even a photo to look at in which the hydration tube is in place. I assumed it all had something to do with the figure-8 bungee/Velcro patch on the left-side strap, though, so I played around a bit and finally figured it out—at least, I think I did. Given the whole "tube management" thing, it's odd that the Dipsea doesn't come with its own hydration bladder. The nice PR guy I talked to said it's because so many active people already have bladders they can use from other packs. Luckily, I did have one lying around—but what about folks investing in a trail pack for the first time? Bren is an avid hiker but she doesn’t have a hydration bladder, so she'd have to shell out an extra $20 or more to buy one. Not that you have to use the bladder. On our shorter hike the next morning, I left the bladder out (having been too lazy to wash it the night before) and simply tossed a water bottle in the main pocket. It was a little inconvenient when I got thirsty mid-hike and had to take the pack off to reach the water, and it also didn't leave much room for the other stuff I wanted to bring. But it worked in a pinch. Overall, this is a good, cute half-day pack (it's too small for a true day hike—where would you put your lunch? ), and it would also work nicely for a trail run or bike ride. Now that I've figured out how to manage that wily tube, I'll reach for the Dipsea the next time the mountain trails call—if, that is, I ever get around to washing out that bladder. Pros: A light, comfy, super-cute pack that moves with your body, won't overheat your back, and has just enough handy places to put your stuff. Cons: It's hard to figure out how to work the tube management system—plus you have to supply your own hydration bladder. Extra tip: Chill your water first, since the part of the pack that holds the hydration bladder isn't insulated.